Uganda's players and officials want to honour the late international keeper Abel Dhaira by qualifying for the 2017 Africa Cup of Nations in Gabon. A memorial service was held in Kampala on Monday for the 28-year-old, who died in Iceland from cancer last week. "We're going to work very hard to qualify for Gabon to dedicate it to Dhaira," Moses Magogo, the Uganda FA president told mourners. Uganda are currently joint top of their qualifying group with Burkina Faso. Dhaira's former international team-mate Tony Mawejje, who also played in Icleand, echoed Magogo's sentiments. "It's a very difficult time for us as a national team, but we shall work hard as a team battle to qualify for the Nations Cup for Dhaira," he said. Magogo also thanked the President of Uganda Yoweri Kaguta Museveni for the government's financial support to ensure that Dhaira's body was flown from Iceland, where he played for IBV Vestmannaeyjar, for burial. Dhaira was part of a goalkeeping family in Uganda, his father Bright was also a former international while his brother Eric plays in the country's top flight for Soana. "It is very difficult to speak about the game of football and not speak about the name Dhaira - this family has had an impact on goalkeeping in this country," Magogo continued. The current Uganda coach Milutin 'Micho' Sredojevic also paid tribute to Dhaira. "Abel was a close friend to many of the Uganda Cranes players we are devasteted by his unexpected passing," he explained. "As we approach the last two Nations Cup qualifiers we shall have a very big reason for Abel Dhaira to go all the way and qualify after 39 years. 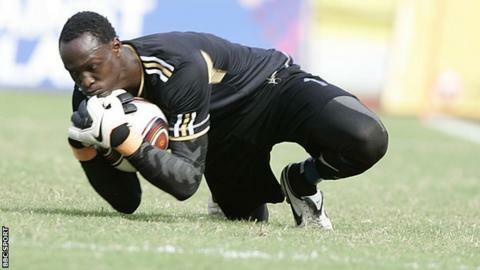 "Uganda has lost a great goalkeeper and we shall always miss him." Dhaira will be laid to rest on Wednesday in Mayuge district in Eastern Uganda. He made his debut for the national team in 2009 and helped the Cranes win the regional Council for East and Central African Football Associations (Cecafa) Senior Challenge Cup in 2012 on home soil. As well as playing in Iceland his club career included stints with Uganda sides Express and URA before moving to play DR Congo's AS Vita and later Tanzania's Simba. It has also been revealed that another former Uganda international Mathias Kaweesa is also battling cancer.